A Charles II Trefid Spoon, Edward Lewis, Liverpool, c.1680. Priced at £4,450 from Michael Baggott Silver and Antiques. Until the end of the 17th century hallmarking regulations were not as strict. Given the poor condition of the roads, not to mention the dangers of highway men, silversmiths would rather put their own marks onto their wares than risk the journey to an Assay Office. The silversmiths working in Liverpool were no exception and a handful of these very rare pieces survive today. There is no formal register of silversmiths who worked in Liverpool in the 17th century, nor is there a standard to which their marks comply. What makes pieces of Liverpool silver identifiable is often the use of the word ‘Sterling’ stamped in conjunction with the makers marks. 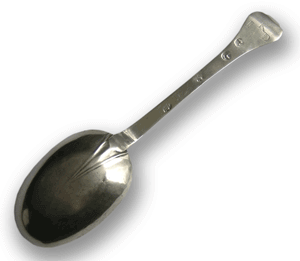 The silver spoon illustrated here was made by the Liverpool silversmith Edward Lewis in 1680. As part of his mark he incorporated the Liver Bird (taken from the Civic coat of arms). Lewis was working from c.1672 as a silversmith and jeweller in Water Street and is one of the earliest Liverpool Goldsmiths. He was a member of the Common Council in 1684 and died not long after in 1691 (his widow then carried on the business and married his assistant Robert Shields in the following year). There remained a handful of silversmiths working in Liverpool through the 18th and 19th centuries but laws forced them to have their silver marked in an official Assay Office, so many registered their marks in Chester. If you would like a free, no obligation valuation of your Liverpool silver please use the form below.